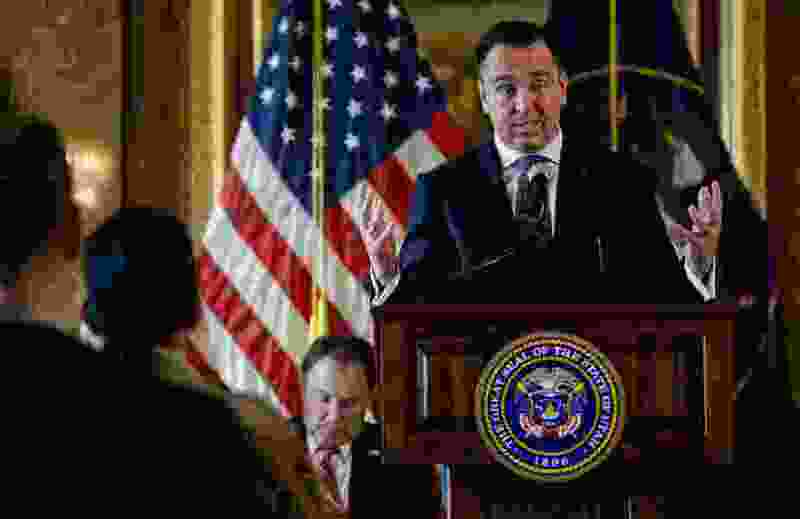 (Francisco Kjolseth | Tribune file photo) House Speaker Greg Hughes discusses the progress made as supporters and opponents of UtahÕs medical marijuana initiative joined with Utah Gov. Gary Herbert and legislative leaders Thursday, Oct. 4, 2018, at the Utah Capitol to announce a Òshared visionÓ for cannabis policy. Unlike Prop 2, the legislation calls for a state-centralized cannabis pharmacy that would fill orders from patients for pickup at a local health department. Five licenses for privately owned “cannabis pharmacies” would also be up for grabs. The bill tightens up the list of qualifying conditions for patients and the varieties of marijuana products that would be allowed, prohibiting most edibles. Moreover, under the legislation, physicians and pharmacists would control medical marijuana dosages for patients. Rep. Carol Spackman Moss voiced doubt about that provision, saying that many patients have to experiment with different cannabis products and quantities before finding relief for their symptoms. Because marijuana is federally illegal, medical professionals don’t always know how to set the proper dosage, she said. Michelle McOmber, CEO of the Utah Medical Association, which is supportive of the consensus bill, said other states have created courses to educate physicians and pharmacists about medical cannabis. Utah can use these training programs as a springboard, she said. Not all proponents of medical cannabis have been pleased with the deal hashed out behind the scenes by legislative leaders, advocates and The Church of Jesus Christ of Latter-day Saints. Steve Urquhart, a former Republican state senator, said the agreement announced Oct. 4 was an "electioneering ploy." He noted that support for Prop 2 seems to have tanked since the agreement was rolled out. A June poll found about 66 percent of voters planned to back the ballot initiative, compared to 51 percent earlier this month. The so-called compromise was "intended to suppress voter turnout. It was intended to confuse the voters," he said. Other speakers praised the agreement as a more solid path forward. DJ Schanz of Utah Patients Coalition, the group that spearheaded the ballot initiative, said he believes those involved in the negotiations had good intentions. “Proposition 2 is not my dream bill of how cannabis would be rolled out. This compromise is not my Utopian ideal of how things would be rolled. But what it is, I think, is a possibility for a workable medical cannabis program,” he said. Marty Stephens, former House speaker and now a lobbyist for the LDS Church, also reiterated support for the agreement, even if voters reject Prop 2. Patients and their family members also spoke during the hearing, including Rachel Peterson, a North Ogden resident whose teenage daughter suffers from seizures. Peterson began to cry as she explained that her daughter’s neurologists aren’t sure how to help her. Speaking to Democratic lawmakers Wednesday, Hughes also contended that there is enough time to vet a medical marijuana proposal thoroughly between now and the special session in mid-November. Formal and informal meetings on the drafted bill will continue to take place in the coming weeks, he said.